Listening is one of the most loving and just actions we can take. By listening, ISAAC creates new community and new hope. 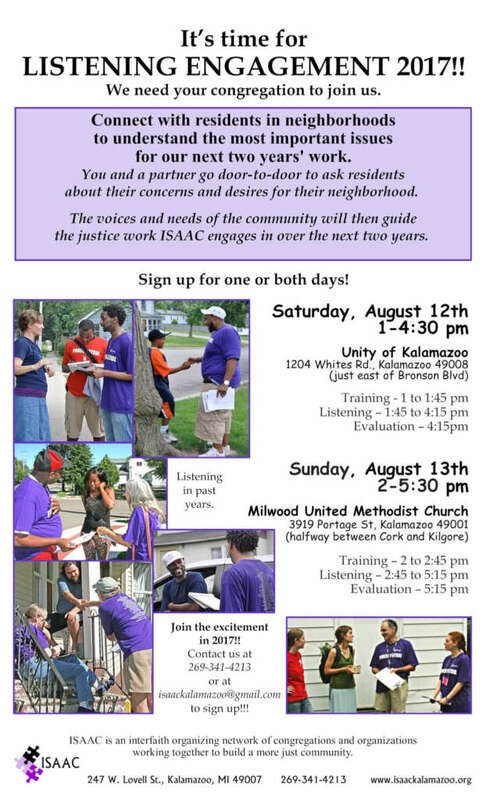 On Saturday afternoon August 12 and Sunday afternoon August 13, ISAAC congregations will fan out on Westnedge Hill and in the Milwood neighborhood to listen to our neighbors. We will listen to what is on their hearts and minds. ISAAC practices listening all the time but for Listening Engagement, we put on totally fresh ears! What our neighbors tell us will guide our choice of issues to work on for the next two years. You can join ISAAC in this listening engagement. You’ll get snacks, a brief training, a partner, a map, a list of questions to ask, and a clipboard to jot down our neighbors’ answers. It’s fun! On Saturday afternoon August 12, we’ll be on Westnedge Hill, 1:00-4:30, starting and ending at Unity of Kalamazoo, 1204 Whites Rd (just east of Bronson Blvd), Kalamazoo 49008. On Sunday afternoon August 13, we’ll be in the Milwood Neighborhood, 2:00-5:30 pm, starting and ending at Milwood United Methodist Church, 3919 Portage St. (halfway between Cork and Kilgore), Kalamazoo 49001. Can you join us? Sign up by contacting us at [email protected] or 269-341-4213. And see the “New ISAAC T-shirts!” article to order your T-shirt to wear that day, or any day!